“I’m not a complainer. That’s pointless. But it seems like nothing is ever easy for us.” Tatiana looks down at her 11 year old daughter, Dasha, who is following our movements with a big smile and wide blue eyes. Dasha has cerebral palsy, and is intellectually disabled. She lives with her mother and father, her grandmother, and her young twin sisters in Minsk, Belarus. 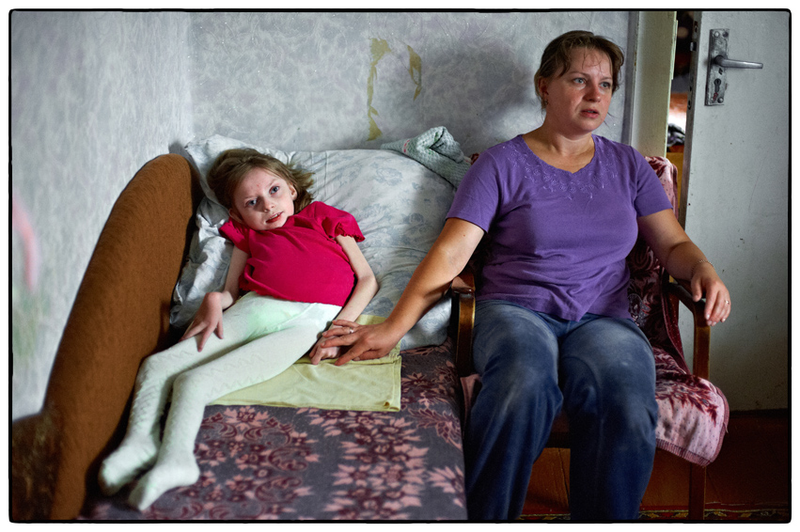 She is part of Chernobyl Children International’s Community Care program. “She was born healthy. The whole nightmare began when she was a little over a year old. She was teething and developed a terrible fever. We took her to the hospital, and before they lowered her fever she lost consciousness. They told me that she lost the oxygen supply to her brain for a while. But she seemed fine when she woke up, and we thought everything was OK.” “I guess she seemed a little developmentally delayed. Chernobyl Children International’s Community Care program gives parents the support they need to take care of their seriously ill and disabled children at home, rather than place them in an institution. “With scoliosis, physical therapy is absolutely essential. They also send her an occupational therapist, and a massage therapist.